I’ve heard it said that you don’t choose the books you read—great books choose you. In some peculiar way, I believe that is what happened in 1999 as I consumed Charles Colson and Nancy Pearcey’s How now shall we live? Never before had I planned to read a 600-page, non-fiction book, but once I devoured the introduction (a version of which is re-published in this edition ofComment), I could not put it down. On vacation in Mexico, I found myself reading this thick, green, hardcover book by the pool, on the beach and in my room during every waking moment. My worldview was challenged and my view of Christian influence in culture was invigorated. My wife wondered what had gotten into me—and with good reason. When was the last time you saw a grown man create flash cards for reading that was not required . . .on vacation?! Up until that time, I had wrestled with several questions surrounding the role of my faith in this world. I had no problem grasping the idea of eternal life and the need for personal salvation, but the answers I was familiar with were deficient when it came to how my faith practically played out during my years in this present world. Nobody addressed what to me seemed an obvious problem: Christianity gained more conversions in America over the last two hundred years than any other faith. 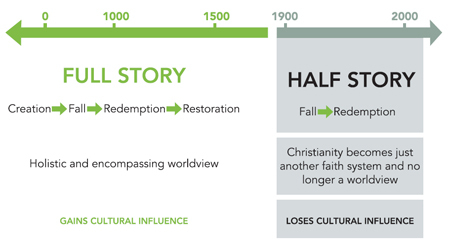 Simultaneously, Christianity steadily lost cultural influence despite its rapid conversion growth. As I read Colson and Pearcey’s book, for the first time in my life I encountered Christians who had dared to set aside the talking points and “go off message.” They had recognized the problems and offered biblical, logical solutions. I began to reconnect to Christian purpose. Colson and Pearcey laid out all of what being a Christian was about. They challenged my worldview and invigorated my view of Christian influence. It felt simple, yet complex, true and historic. I was convinced that everyone I knew needed to read this book. I just knew that if more Christians could grasp this bigger picture, it could change the face of Christianity throughout our nation. Unfortunately, I knew none of my twenty-something friends would want to read a 600-page book. So, I was left with two choices: get new friends, or, do everything within my grasp to take these ideas and convey them in the most practical, life-giving, and encouraging way to everyone I could. I chose the second option. As Henry Blackaby writes in Experiencing God, the role of every Christian is to “watch to see where God is at work and join him.” A shift in Christian praxis within our culture may be one such place where God is at work. I believe God is calling the church in the United States to grasp its calling to influence the greater culture. We can feel it in the rebuke of pretentious Christianity and sense it in the hearts and minds of young Christ-followers desperate to live lives pleasing and honouring their Maker. I can’t imagine anything more important or significant in our lifetimes than to be a part of the church’s recapturing its role in shaping culture. When we do this, the life-giving message of Jesus Christ will go forward in ways unprecedented throughout the 21st century. Modern-day evangelicals are most familiar with God’s saving grace—the means by which God’s saving power, through the death and resurrection of Jesus Christ, can redeem people from their sin and give them new life in Christ and throughout eternity. What we hear less about, today, is another theological concept called common grace. Wayne Grudem defines common grace as “the grace of God by which he gives people innumerable blessings that are not part of salvation.” This common grace is available through and to all of His creation. David refers to it in Psalm 145: “The Lord is good to all, and His mercy is over all that He has made . . . The eyes of all look to you, and you give them their food in due season. You open your hand; you satisfy the desire of every living thing.” Jesus also referred to it when he admonished us: “I say to you, love your enemies and pray for those who persecute you, so that you may be sons of your Father who is in heaven. For He makes His sun rise on the evil and on the good, and sends rain on the just and on the unjust” (Matthew 5:44-45). Understanding both saving grace and common grace helps us to understand the cultural mandate. It dates back to the Garden of Eden when on the sixth day of creation a momentous delegation unfolds as God hands Adam the responsibility to pick up where He has left off. He is called to reflect God’s image and to have dominion over all things, to “steward” God’s good creation and all of its resources in the service of God and man (Genesis 1:26-28). God’s declaration to humanity of their divinely appointed duties provided deep purpose and meaning to human life. Humankind were called to partner with God in the work He wanted to do throughout creation. God cares not only about redeeming souls but also about restoring his creation. He calls us to be agents not only of his saving grace but also of his common grace. Our job is not only to build up the church but also to build a society to the glory of God. As agents of God’s common grace, we are called to help sustain and renew his creation, to uphold the created institutions of family and society, to pursue science and scholarship, to create works of art and beauty, and to heal and help those suffering from the results of the Fall. Christians live to serve the common good of our neighbours, and that service creates unmatched influence on the culture. For centuries, Christian growth and maturing was understood as a gradual process. The historical idea of a “catechesis” was based on an intentional, deliberate process of growth that introduced a new believer to the life they aspired to live on this earth. Conversion was not achieved in a moment. Both the mentor and the disciple saw it as a process that required serious, disciplined engagement over time. Although eternal salvation might be grasped in a moment, the lifestyle of winsome engagement could take a lifetime to achieve. The Christian explanation for existence made sense to Kings and paupers alike. As Colson and Pearcey write, it was a “comprehensive life system that answers all of humanity’s ageold questions: Where did I come from? Why am I here? Where am I going? Does life have any meaning and purpose?” It competed and won the day against other stories’ explaining human existence. Even intellectuals embraced it, since Christian faith offered answers to the nagging questions of the human condition. Sadly, this way of thinking would be drastically transformed by the Enlightenment and the Second Awakening. The Enlightenment initiated a philosophical shift that would change everything. The basis for human existence shifted away from God and toward humanity. Human reason, scientific research, and individual achievement had no need for divine intervention. Innovation was in the air. Speed, volume, and progress would become the celebrated measures for success, as Michael Metzger observes. Speed would overtake intentionality, volume would surpass quality, and progress would overrun tradition. This philosophy of human-driven cultural advancement characterized the modern view that would influence Christian thinking. Here is one possible way of explaining what happened to North American Christianity as it developed alongside the influence of the Enlightenment. Movements like the Great Awakening in England, New England, and the eastern seaboard of North America, and the Second Awakening that spread from New England through to the American frontier in the late 1700s and early 1800s introduced many people to Christ. Methodist preaching and Presbyterian Lord’s Supper gatherings staged as camp meetings convened on the frontier, having little effect on the educated intellectuals in the city. The great orators of the day used emotional preaching and proclaimed boldly the most dramatic points of the Christian story; “You are a sinner, and Christ’s death and resurrection can give you new life. If you get saved, you will have eternal life in Heaven.” They initiated special invitations to capture the most possible conversions from a given audience in a limited amount of time. They didn’t have the benefit of living among the people and modeling the life of a Christian over the course of years. Their demanding schedule of traveling by horseback from town to town gave them weeks, and sometimes just days, to convey the depth of the message of Jesus. It’s easy to see that when forced to convey the most dramatic parts of the Christian story in a short period of time, parts of the story are easily overlooked. In the process, Christianity was losing its profound and life-giving answers to central questions no longer representing an entire life-system and worldview. It had become relegated to a personal, spiritual decision about where you would spend the afterlife. As more evangelical Christians adopted this half-story explanation of the faith, their cultural influence began to fade. The emphasis on heavenly pursuits overshadowed the idea of living a life that offered common grace and promoted cultural influence. And as personal decisions for Christ became the short-term measure of success, the church added shallow converts who were unable to see the cultural implications of their faith. If being a Christfollower is only about getting a free pass to heaven and trying to bring everyone else with them, it will alienate Christians from the broader dialogue about life, justice, and the here and now. Relying on the half-story explanation of the gospel is like handing someone a John Grisham novel with the first and last fifty pages removed. They’d be left with the middle portion of the book, a half-story depicting some of the most dramatic developments of the story but giving little understanding of the characters, their aims and beliefs, and how they got into their dilemma in the first place. The story might still be intriguing but the reader would be left feeling empty. The impact of the story would be lost. They could call themselves a John Grisham reader, but they would miss most of what makes him a compelling author. And the story doesn’t make sense to them because it is an incomplete truth. When Christians dismiss the cultural mandate as an insignificant part of the Christian life, separatism and piety increases and cultural influence fades, But, if Christians learn and embrace the full story gospel and partner with God in restoring and redeeming his creation, their cultural influence will follow and the Good News will spread. How now shall we influence? Hunter goes on to argue that “the renewal of our hearts and minds is not only important, it is essential, indeed a precondition for a truly just and humane society. But by itself, it will not accomplish the objectives and ideals we hope for.” This could explain why Christianity as practiced by many well meaning, admirable Christians in the past failed to achieve significant traction. What are the social institutions of our culture that Hunter refers to? They are the social institutions that govern any society, including business, government, media, church, arts and entertainment, education, and the social sector. Their combined output of ideas, films, books, theology, websites, restaurants, investments, social work, laws, medical breakthroughs, and technology drive an entire nation. The ideas and values they perpetuate sustain the moral fibre and social conscience of the culture. The people who lead these influential institutions shape the ideas, thoughts and preferences of millions of others. If Hunter is right, a very few can effect dramatic shifts in the convictions and aspirations of a culture. The church is a unique channel of cultural influence. Few other institutions draw participants from so many areas of society. When Christians embrace the common goals of both redeeming cultures and individual souls, the possibilities for positive cultural influence dramatically increase. I believe that the church is the hope of the world and is positioned like no other channel of influence to shape culture. Its people are called to be in the world. As John Stott puts it inBasic Christianity, “We find ourselves citizens of two kingdoms, the one earthly and the one heavenly. And each citizenship lays upon us duties which we are not at liberty to evade.” Although the work of culture creation may take place outside the physical walls of a church building, the local church creates a natural space where social networks of leaders, within all seven channels of culture, can work together towards a common goal. Nowhere else does this potential for synergy exist. Unlike other channels, the church is a living organism where God’s spirit constantly moves and seeks to express Himself through a willing Body. Sadly, by focusing on just the “spiritual” and the afterlife, the Christian church has strayed from its potential influence in the here and now, positioning itself instead as just another subculture. Many Christians currently hold unique and influential positions throughout the seven channels of culture, but have never been supported by fellow believers. Consider my thirty-four-year-old friend Dan, a leader in the business channel of cultural influence who meets with captains of industry and strategic leaders throughout the free world. He cares deeply about Christian engagement in the place God has called him, but doesn’t feel comfortable labelling himself a Christian due to the negative baggage that comes with it. When we first met four years ago, Dan was desperate for a community of believers that could understand him and his life in the wider culture. He had no community or church that could support him as he tried to fulfill his calling. Dan had given up hope and felt like the only Christian in his predicament. His story is all too common. In the work that I do, I come across cultural leaders who feel disconnected from the local church or, worse yet, misunderstood or “used.” The story for some is that the church tends to only be interested in them if the church organization can benefit in some way. Church leaders fail to recognize the current and potential influence these leaders wield within culture, and they unknowingly drive them away. Still, an undeniable opportunity for the church to regain ground exists. My friend Jon, a top model in the fashion industry, experienced something different in the local church. As he pursued the opportunity to lead a culturally redeeming project to captivate the vanguard of the fashion industry, he found help and support. His pastor spent time with him and probed deeply to find ways the church could actively support these efforts. Whether volunteering to help at local events or assisting in the organizational and administrative details of his project, this church provided the back-up Jon needed to engage where God has placed him. If we produce thousands of new church-communities that regularly attract and engage secular people, that seek the common good of the whole city especially the poor, and that produce thousands of Christians who write plays, make movies, express creative journalism, begin effective and productive new businesses, use their money for others, and produce cutting-edge scholarship and literature we will see our vision for the city realized and our whole society changed as a result. This vision demands that leaders in the church wrestle with the complexity of embodying the Gospel in culture. As the church rediscovers its unique role in culture, and supports the calling of their cultural influencers, it will be a force for good in our communities, cities and the country. The call to the church—to all Christians—is to rediscover the cultural mandate, embracing the opportunity to influence culture. In the church, we must teach about calling and cultural influence and provide vital support to cultural leaders. We must become an integral piece of the local culture, convening and encouraging creation of future culture that serves the common good. We must become connoisseurs of good culture, recognizing and celebrating the good, the true, and the beautiful to the glory of God, and begin to lead the conversations that will shape future culture. There’s the big idea. The vision. The challenge. The opportunity. Here are a few steps you can take to realize this vision personally and throughout your church. 1. Explore and embrace the cultural mandate. Educate yourself on the whole Gospel—the complete counsel of God—and become familiar with how the story (creation, fall, redemption, consummation) shows up in all of life and brings clarity to the Christian’s responsibility in a fallen world. Read Genesis 1 and 2 with this perspective in mind and investigate other writings that delve deeply into the topic. Read books by C. S. Lewis, John Stott, Os Guinness, Chuck Colson, Nancy Pearcey, Michael Metzger, or Neil Plantinga for specific insight into the cultural mandate. 2. Teach about calling and cultural influence. Inspire people within your church to discover their callings and pursue them with excellence, while celebrating their successes. Educate those around you about how cultural influence happens. Find the people within your church who hold unique and influential positions throughout the seven channels of culture. Help them cultivate and create culture that serves the common good. Your interest in serving them will go a long way in building their confidence in the church’s understanding of their opportunities for influence while reminding them of God’s provision. 3. Connect with your local community. Ask yourself, as Rob Bell suggested in a March 2006 podcast, “If your church were removed from the community today, would anyone even notice?” As an integral piece of your local culture, adopt a missional approach to the needs of your community. Add value to the culture, support local artists, businesses, and schools, and serve the community with volunteers for good events that are redemptive in nature. Be an advocate for goodness and beauty throughout your surroundings, so that if you ever left you’d be sorely missed. 4. Look for the good. Become known as connoisseurs of good culture, able to recognize and pick it out in a fallen world. Instead of being offended when confronted with darkness, suggests Michael Metzger, be provoked to get involved. Challenge yourself to find something good in all things and identify the redemptive nature of humanity and its place in creating a better world. 5. Convene conversations about future culture. Initiate conversations about the values of your community. Host them at your church or in a neutral location and drive the cultural conversation instead of simply responding to it. Raise issues of injustice and offer potential solutions. Be the first to praise the good culture being created in your community and inspire imagination around opportunities that support the common good, elevate beauty and align with truth. Most of all, convene the cultural leaders in your local church to encourage and inspire them to renew their channels of influence. None of us knows how human creativity will alter the world we live in next. However, our Christian responsibility is to be good stewards of all that God has entrusted to us and to renew all things. This alone, brings glory to God. How Can the Church Effectively Influence Culture? Promote “Biblical Christian Living” so that Christ’s purposes can be accomplished and God is glorified. At the same time there seems to be immense pressure on believers from society. Ed Brewer – oh yes but it has changed since that video.